Lucy decides that instead of going to the lake for a summer vacation, the family should buy a boat she sees advertised. Lucy talks Viv into buying the "fixer upper" boat that's barely seaworthy. Although it needs a huge amount of work, they fix it up. When Lucy and Viv put it into the water, it breaks its mooring and drifts out onto the lake, trapping a sea sick Viv and a bossy Captin Lucy without a sail. To add insult to injury, the boat springs several leaks. Special Notes: The finale of this episode has one of the last really great physical comedy scenes between Lucille and Vivian. 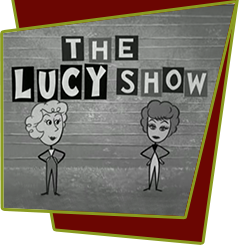 This was intended to be the last episode of The Lucy Show. Lucy only came back to TV because Desilu couldn't sell their other shows without a hit. By Lucy doing this show she could say "take the other shows to get my show." This was the last black and white episode. Bloopers: When Lucy and Viv run the boat mast into a window in the French doors, there's no glass in the window. The glass shattering sound is also delayed.